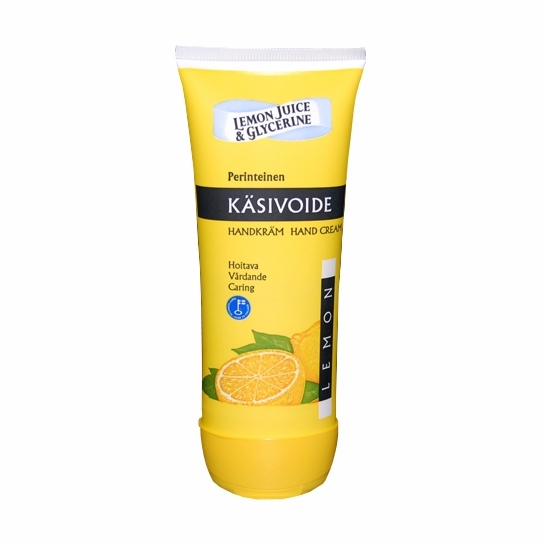 More about Lemon Glycerine Hand Cream - 95 ml A miracle balm for dry skin, the Lemon Glycerine Hand Cream is a product customers have asked for and so, we delivered. 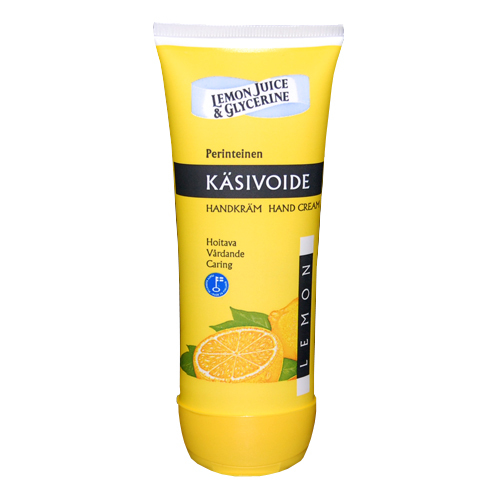 The lemon juice and glycerine work together to keep your skin moisturized with even the slightest dab of lotion. With a subtle lemon scent that is pleasant and not overpowering, you can wear this cream inside and outside of the sauna. Try it, and your skin will thank you! A wonderful hand cream, no sticky residue. And itâ€™s Finnish! I live in a desert and have naturally dry and sensitive hands. I sampled this product at a festival, but forgot to purchase it in all the hustle and bustle. I was so pleased with the results after one application that I set out to find it online and that is how I discovered FinnStyle (fortuitous for me). This cream soaks into your skin and then forms a protective layer on your hands. Unlike products containing silicones, it lets your skin breathe. When you first apply it, it is the consistency of a thick gel, but soon dries, leaving your hands moisturized but not greasy. It has a very mild lemon scent that dissipates quickly. I absolutely love this hand cream. When you wash your hands as much as I do in the kitchen and combine with the dry winter weather, this cream is the best I've found. You need only a pea size amount and gently rub in. Well worth the money! I haven't been able to find this product locally for many, many years! After squeezing the last bit out of the tube, I finally decided to look online, and I FOUND IT! I tried this product in the finnstyle retail location and upon returning home i searched the site only to find they did not carry it! I was crushed, but after some patience the product became avalible on their site and I ordered right away. A little truly goes a long way with this product and therefore a bottle will last me quite a while. It leaves my hands very soft, with little greasy residue afterwards (if you use a small dab). I am very happy with this product as a whole, and will continue to buy it as needed! May I please see the list of ingredients on the tube? I just had to return some so-called "lemon glycerine" hand cream, because it had many other ingredients besides lemon and glycerine, so was very greasy. What I like about glycerine is that it is NOT greasy, I can't stand grease on my hands.